American metal manufacturers are moving forward with operational optimization efforts and seeing considerable results. In fact, labor productivity in the space increased by more than 3 percent in 2017, according to research from the U.S. Bureau of Labor Statistics. U.S. metal manufacturers can achieve further gains by turning their attention to cycle times. A surprisingly large number of businesses overlook them. In 2016, 45 percent of manufacturers operated without cycle time targets for new product lines, according to analysts at IndustryWeek. Enterprises in the U.S. market that want to compete strategically and see further growth must address this critical variable. But how? 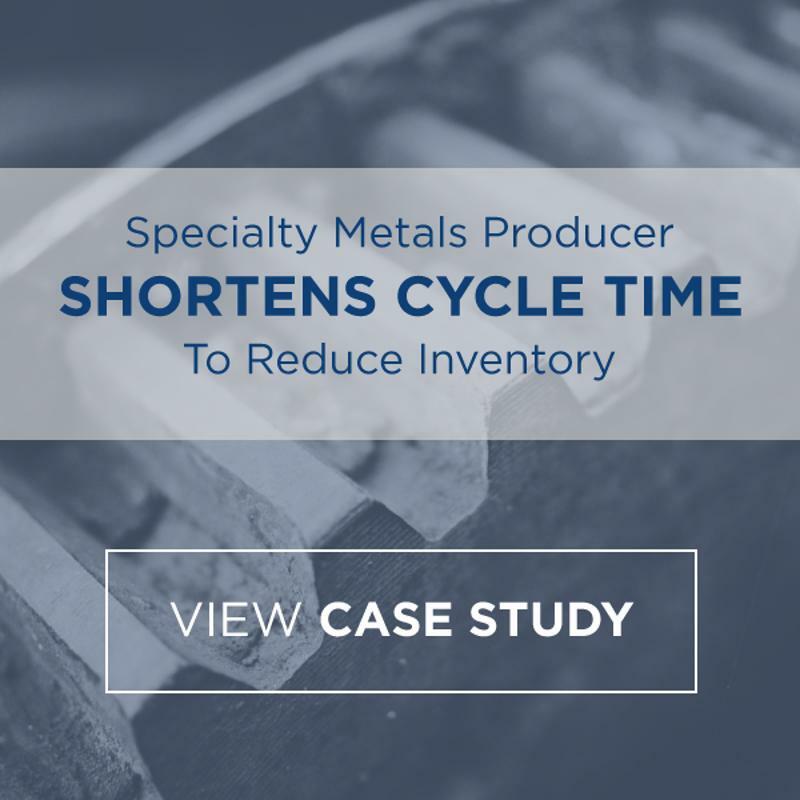 Let’s take a look at three surefire methods to reduce cycle time in metals manufacturing. Cycle times suffer when mission-critical assets go down unexpectedly. Unfortunately, this is a common occurrence across all industries, according to the market research agency Vanson Bourne. More than 80 percent of businesses have experienced at least one instance of unexpected downtime over the last three years, and 45 percent said they were unable to deliver to customers on time as a result. Metal manufacturers that want to meaningfully reduce cycle time must put into place maintenance programs that prevent operational disruptions linked to machine dysfunction. Predictive maintenance initiatives are the ideal solution that more than half of manufacturing firms have adopted, according to a study from Plant Engineering. Advanced shop floor analytics platforms support these innovative strategies, providing maintenance teams and other operational stakeholders with up-to-the-minute machine performance data. With this information flow available, firms can monitor their equipment and address small mechanical hiccups before they turn into downtime-causing disasters. In the end, assets that operate unimpeded reduce cycle time. The big data revolution has catalyzed change across numerous industries, including the manufacturing space. More than 80 percent of U.S. manufacturers leverage enterprise analytics solutions, according to researchers from IQMS. These systems give businesses the power to oversee the entire supply chain, from the product development to last-mile delivery. This wide-reaching insight is priceless, especially in today’s fast-paced economy. Real-time analytics are, of course, ideal for metal manufacturers that intend to cut back their cycle times. It allows them to pinpoint sluggish shop floor components and institute end-to-end improvement. Traditional methods for collecting data pale in comparison to modern data gathering strategies used in the manufacturing space today. Older approaches centered on fragmented sources, from which analysts must pick and choose insights for further processing. By the time these steps have been completed, the resulting information is likely no longer viable. Conversely, shop floor intelligence programs with real-time analytics solutions at their cores give manufacturers the power to access key data as sensors collect it, and make operational adjustments, leading to productivity and output gains. As mentioned above, machine health and cycle time go hand in hand. However, while predictive maintenance strategies can keep assets up and running, they embody only one variable of the equipment usage equation. In addition to ensuring that shop floor machines are running as designed, metal manufacturers must search for ways to optimize their performance and get as much out of these assets as possible. Strong overall equipment effectiveness initiatives support such improvement efforts. Metal manufacturers can leverage advanced data collection tools or more traditional methods to find accurate readings for each of these items. With these metrics, firms can calculate their availability, performance and quality rates, which, when multiplied, reveal the overall OEE percentage. Operational teams can increase the figure by making changes to production lines to boost asset performance. Some manufacturers go beyond OEE best practices and leverage a newer strategy called high-performance machining, Better MRO reported. This entails building all-encompassing equipment management workflows with cutting-edge hardware and software components meant to bolster productivity and output. Businesses in the metals manufacturing space can drastically reduce cycle time and experience considerable growth by embracing these practices. However, few should attempt to implement these and other large-scale fixes without assistance from knowledgeable partners with proven expertise and valuable perspective. Here at USC Consulting Group, we offer metal manufacturers the opportunity to improve their production processes and lay the groundwork for continued success. If you’re interested in learning more about our work in the metals industry, contact us today for more information. Aluminum and Steel Tariffs: What Do They Mean for US Industry?